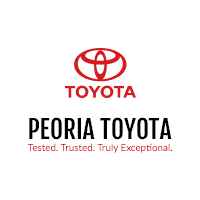 A man going by the name, “Professor Pothole” has finally been caught by the Peoria Toyota team after destroying Peoria roads all winter! Service Manager Dan Kmieciak has apprehended this, um…. villain, and is here to fix your vehicles! Now through 3/30/19, he is running the Service Manager’s Pothole Special! We will rotate and balance tires, 4 wheel alignment, AND perform a brake inspection all for only $129.95. Click this link to schedule your service today!